For those with small kitchens (and in particular galley kitchens), finding design inspiration can prove challenging, with Pinterest, Instagram and other interiors hot-spots favouring the large, spacious kitchens that many of us can only dream of. However, as our stylish galley kitchen design ideas will demonstrate, having a small kitchen doesn't have to mean making style sacrifices. Covering everything from small kitchen storage solutions and tips on making your space seem larger and lighter, to incorporating interiors trends and injecting personality, you'll be well equipped to embark on an overhaul of your of small (but mighty) galley kitchen. Find out everything you need to know about planning, designing and costing a kitchen (of any size) in our ultimate guide. 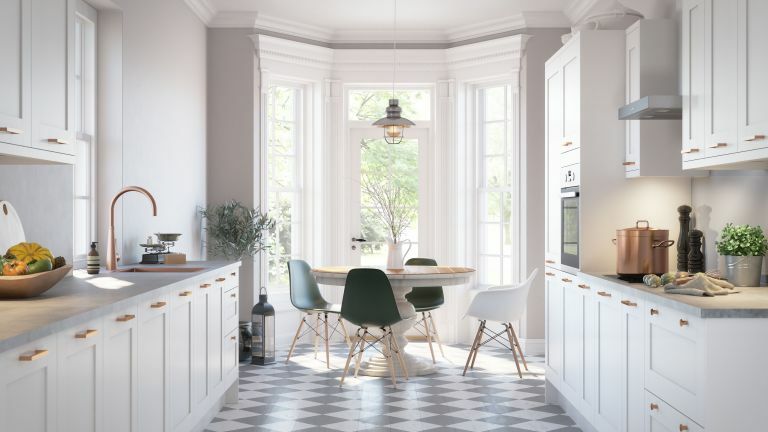 Whether you're a renter looking to make landlord-friendly alterations, or a homeowner seeking affordable solutions for a tired galley kitchen, creating the kitchen of your dreams could be as simple as a lick of paint. From bright, happiness-inducing shades, to moody and atmospheric interiors, painting is the easiest way to incorporate trends. Don't let the idea of DIYing put you off, either, as our handy guide to painting kitchen cabinets will talk you through the steps. We love the millennial feel of this pop of pink in the kitchen, especially when paired with a statement piece of monochrome artwork. Looking for space-stretching galley kitchen design ideas? Creating a focal point at the end of a galley kitchen is a powerful design tool that draws the eye, making a small space feel longer and larger. This trick is particularly effective if you're fortunate enough to have windows at the end of your galley kitchen, as natural light is also helpful in creating the illusion of space. Pair with white and light wood kitchen furniture – we love the Tatton White Kitchen from Magnet – for a spacious and contemporary finish. Remember what we said about focal points in galley kitchens? Creating a gallery wall at one end of your kitchen – particularly if it's the wall you see when entering the kitchen – is an effective means of achieving this elongating effect. We'd recommend browsing sites such as Desenio, Etsy or Society 6 for prints and picking up frames from Ikea – the Ribba Frame is an affordable favourite. Inspired by this kitchen? Take a look at these quirky gallery wall ideas and recreate your own. Opting for kitchen cabinets with a sleek finish is a great option if you're keen to design a galley kitchen that has a distinctly contemporary, yet compact feeling. When designing your galley kitchen, plan the storage you'll need with precision, and bear in mind that open shelves will keep everything to hand but need to be kept neat; that deep drawers are better than base cabinets for maximising space; and that wall cabinets should be as shallow as possible if your kitchen isn't to feel too narrow. Specially designed corner units are an especially useful addition, allowing you to make use of space that might otherwise have been wasted. Speak to your kitchen designer about space-saving features during the early stages of design and development. If you need any more advice on what to ask a kitchen designer then have a read of our guide. They're characteristically short on floor space, so galley kitchen design ideas that maximise the height potential of a room are a real bonus. If you're worried about ceiling high cabinets making your kitchen feel small and boxed in, we'd recommend opting for a crisp white finish. White is space enhancing and timeless (meaning you won't go off it as soon interiors trends change). Pair with woods and a stripped back brick wall or metro tile design for a sophisticated, Scandi finish. You can actually create an exposed brick wall yourself, just follow our step-by-step guide. While it's true that the easiest way to create the illusion of space in a small, galley kitchen is to opt for an all-white kitchen scheme, this doesn't mean you have to shy away from darker shades entirely. So, fear not, lovers of the dark and atmospheric kitchens trend, it's not entirely off limits. Kitchen cabinets with a darker finish – we love the idea of a deep, inky blue – along with black, aluminium frame windows and dark wood accessories successfully hint at a moodier feeling interior style without overwhelming a small space. Another way to inject colour and create a space-enhancing focal point (there's that design trick again) is to choose a brightly coloured blind which will offset an otherwise monochrome scheme and add interest to the kitchen. We love this Flame Venetian Blind from English Blinds. We have loads more practical (and of course beautiful) kitchen window treatment ideas in our gallery. Patterned tiles on the wall, or floor, are a great option for incorporating colour and character into a galley kitchen, especially when they're used in small quantities. This gorgeous, light blue kitchen maximises space with ceiling high cabinetry and proves that galley kitchens can be a haven for colour. The combination of Blue Split Shift One, Two and Three tiles, all from Bert & May, is successful in achieving a bespoke feel within the space. Keeping the surfaces of a galley kitchen clear is vital as clutter makes a space appear smaller. You'll also want to prioritise maximising surface space for food preparation. This means choosing the best small kitchen storage solutions. In addition to space for storing crockery, cutlery and the dreaded tupperware, you'll also need space to stow away the coffee machines and food processors that have the tendency to be left on display in larger kitchens. Floor-to-ceiling storage is a great option for maximising storage potential in a small, galley kitchen. Open shelving is a great kitchen storage alternative that works well in a galley kitchen. In addition to costing less, overall, than kitchen cabinetry, open shelving also allows for a more relaxed, unfitted finish. Opting for a darker shade of paint, or tiles, behind the shelves is a great way to add interest and dimension to a space, without overwhelming it. Style shelves with only the prettiest pieces from your kitchenware collection. What's more these sort of galley kitchen design ideas don't eat up a lot of budget. This Chef's Edition Kitchen Pegboard from Wearth makes a stylish (and practical) addition to a galley kitchen with open shelving. Incorporating different textures – think a combination of wood, stone, concrete and glass – into a galley kitchen is a great way to create interest and detract from the size of a space. We love the use of dark woods, light stones and glass that make this galley kitchen feel dynamic, well designed and, ultimately, more spacious. The addition of a small, one-seater bench makes for a great dining table solution if you live alone. When designing a small, galley kitchen, it's important to remember that the size of the tiles you choose can make a big difference to the finish of a space. As our handy guide to choosing the right tiles for a small kitchen explains, opting for glossy, metallic or mother-of-pearl finish tiles will enhance a space by reflecting light and giving a grander sense of proportions. Looking for more small kitchen design inspiration? Best types of kitchen worktop: granite, quartz, marble, laminate, glass or wood?